The Night Sky is a seasonal constellation guide. To get started, grab a current Sky Map and click on the season. For a printable sky map, click on the navigation bar ‘Backyard Stargazing’ and then the tab for 'Sky Maps'. Unless it is circumpolar. There are 5 constellations in the sky (at this latitude) all night long every night of the year – Ursa Major, Ursa Minor, Draco, Cepheus, and Cassiopeia. These are the best constellations to start with because they are visible all year long. Plus, if you don't know your directions you will want to start with Polaris (the North Star). Note: Planets and moon phases are not included in this section because they change. Visit the other sections in 'Backyard Stargazing' for the planets and moon phases. The sky map is set for mid-March (10 pm) or mid-April (9 pm) or mid-May (8 pm). Leo the lion is the most prominent constellation in spring. Look for the stars in Leo’s head to look like a backwards question mark. Imagine Leo is looking to the right. The triangle makes Leo’s tail and hind end. The brightest star which would be the star at the bottom of the question mark is called Regulus. Leo is looking at Cancer the crab. There is no significantly bright star in Cancer. To find Bootes and Virgo, remember the saying ‘Arc to Arcturus and Speed on to Spica’. This saying starts with the arc of the Big Dipper’s handle. Look to the overhead, or zenith, for those 7 bright stars in the constellation Ursa Major to make the spoon. Draw an imaginary curved/arched line between the three stars in the handle of the dipper. Then continue that curved line into the sky and ‘Arc to Arcturus’. Arcturus is an orange colored star in the constellation Boötes. It is also the third brightest star in the night sky. Boötes looks like a kite or ice cream cone in the sky. Continue the curved line from Arcturus to reach the bright star Spica in the constellation Virgo. Hercules is rising in the east and bringing in the summer constellations. Click on the tab for the summer. Orion is setting in the west with the winter constellations. Click on the tab for winter. The Big Dipper in the constellation Ursa Major is high overhead. It appears to be pouring something out. Click on the tab for the rest of the circumpolar constellations. The sky map is set for mid-June (10 pm) or mid-July (9 pm) or mid-August (8 pm). High in the summer sky is the Summer Triangle. The three stars in the triangle are some of the brightest stars in the night sky. Vega, the fifth brightest star in the night sky, belongs to the constellation Lyra. Below Vega is the twelfth brightest star called Altair which is part of the constellation Aquila. The third star in the triangle is Deneb. Deneb (nineteenth in brightness) is part of the constellation Cygnus. The stars in Cygnus make up the ‘Northern Cross’ with Deneb at the top of the cross. Look for the cross inside the triangle. Low in the summer sky is the constellation Scorpius. More than any other constellation the scorpion resembles its name. The brightest star is a reddish star called Antares. Follow the trail of stars from Antares to the ground/horizon to make a hook in the sky to resemble the scorpion’s tail. At the end of the hook for the scorpion’s tail, you will find the constellation Sagittarius. Even though there is no prominent star, the stars make the shape of a teapot. Look near the head of the scorpion to find the constellation Libra. Again, there is no prominent star, the stars make the shape of a kite. Pegasus is rising in the east and bringing in the fall constellations. Click on the tab for the fall. Leo is setting in the west with the spring constellations. Click on the tab for spring. The Big Dipper in the constellation Ursa Major is in the northwest. The handle is pointed upwards with the bowl closest to the ground/horizon. Click on the tab for the rest of the circumpolar constellations. The sky map is set for mid-September (10 pm) or mid-October (9 pm) or mid-November (8 pm). Taurus is rising in the east and bringing in the winter constellations. Click on the tab for the winter. Cygnus is setting in the west with the summer constellations. Click on the tab for summer. The Big Dipper in the constellation Ursa Major is low on the ground/horizon in the north. Click on the tab for the rest of the circumpolar constellations. The sky map is set for mid-December (10 pm) or mid-January (9 pm) or mid-February (8 pm). The brightest constellation in winter is Orion, the hunter. Look for the stars to make the shape of a person in the sky with 2 shoulder stars, 2 leg stars, and three stars in a row to make a belt in the middle. Draw an imaginary line through the belt stars to the lower left and you will reach the brightest star in Canis Major called Sirius. You cannot miss it. Sirius is the brightest star in the night sky. Sirius also belongs to the Winter Triangle. The Winter Triangle is made with stars belonging to Orion and his two dogs – Sirius (Canis Major) and Procyon (Canis Minor). Procyon is the brightest star in Canis Minor which is found to the left of Orion. To complete the triangle, use the top left shoulder star in Orion. This star is a reddish star named Betelgeuse (Beatle-juice). Above the Winter Triangle, look for the Gemini twins – the two bright stars named Pollux and Castor. Pollux is brighter and has a yellowish color where Caster appears white. Draw an imaginary line through Orion’s belt stars again, but this time go to the upper right. You will reach Taurus. The brightest star in Taurus is an orange colored star called Aldebaran. Extend the line beyond Aldebaran to reach the Pleaides. The Pleaides is a beautiful star cluster that is also known as the Seven Sisters. Leo is rising in the east and bringing in the spring constellations. Click on the tab for the spring. Pegasus is setting in the west with the fall constellations. Click on the tab for fall. The Big Dipper in the constellation Ursa Major is in the northeast. The handle is pointed towards the ground/horizon. Click on the tab for the rest of the circumpolar constellations. The circumpolar constellations are Ursa Major, Ursa Minor, Draco, Cepheus, and Cassiopeia. These constellations are visible all night every night of the year. They never set but rather make a complete circle around the pole star called Polaris (the North Star) above the ground/horizon. 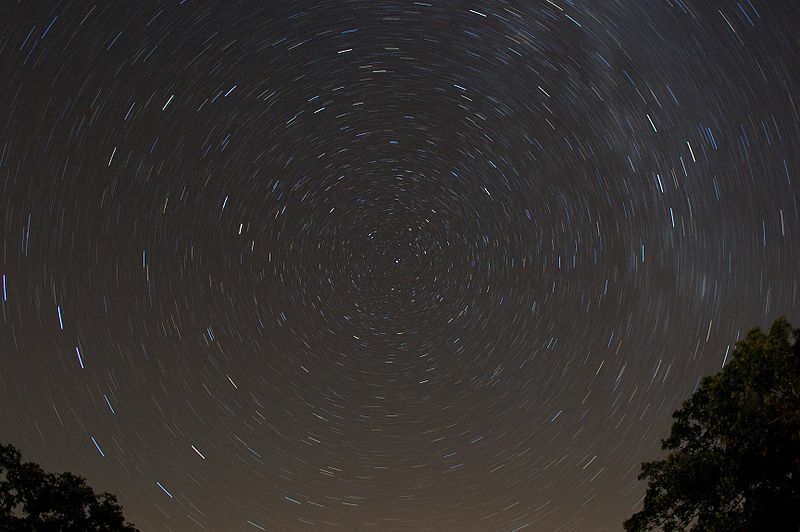 A long exposure photograph shows the circular path of the stars (Polaris is in the center). Before you begin stargazing, you need to find your directions. You need to find Polaris (the North Star). It is located due north, but it is hard to find because it is not very bright. The seven stars of the Big Dipper (part of Ursa Major) will point you to Polaris. The two stars at the end of the spoon in the bowl (away from the handle) are called the ‘pointer stars’. Imagine drawing a line between them and extend that line into the sky from the bowl (do not poke a hole in the bowl or you will get lost). You will extend that line about five times the distance between the pointer stars to reach Polaris. Looking at Polaris, you are facing north. Polaris is the brightest star in the constellation Ursa Minor the little bear. The seven brightest stars in Ursa Minor make the pattern of the Little Dipper. Polaris is at the tip of the handle. The Big Dipper is made with the seven brightest stars in the constellation Ursa Major the great bear. To find Cepheus and Cassiopeia, draw the imaginary line between the ‘pointer stars’ in the Big Dipper through Polaris onward. The stars in Cepehus resemble a house. The imaginary line should reach the star at the top of the house. Continue the imaginary line through that star in Cepheus to reach the stars of Cassiopeia. The bright stars in Cassiopeia resemble the letter ‘M’ or ‘W’ depending on where it is. Draco the constellation of the dragon is difficult to find because the stars are not very bright. The stars snake between Ursa Major and Ursa Minor. Note: Circumpolar constellations are dependent on where you live. At our latitude in the Northern Hemisphere there are 5 circumpolar constellations (listed above).